All-Clad Metalcrafters - When John Ulam founded All-Clad Metalcrafters more than 35 years ago, his discipline as a metallurgist compelled him to bond together different metals to capitalize on each of their unique properties. His bonded cookware was the embodiment of simple, classic design, and proved to perform beyond the capabilities of any single-metal cookware. In the process of perfecting layered-metal bonding, a legacy was born. Today, American artisans, using American-made metals, handcraft bonded cookware in the tradition that established a new benchmark for professional bonded cookware. At each stage of the manufacturing process, every piece of All-Clad bonded cookware is hand-inspected to ensure that it maintains All-Clad quality standards. Ashford - Watches, writing instruments, leather goods, ties, scarves, fragrances, sunglasses, jewelry. Barb and Bear - Online marketplace showcasing the best of New York City artists, designers and craftsmen. Bedol International Group - High-quality, beautifully crafted accessories, including weather stations, clocks, radios, organizers, and calculators. BestWineGlass - Riedel, Ravenscroft, Schott Zwiesel, Bottega del Vino. Calaphon - Premium quality cookware, bakeware and kitchenware. Columbus - Oldest globe manufacturer in the world. While being innovators and leaders, Columbus is also focused on preservation of traditional globe manufacturing processes such as the exclusive mouth-blowing of crystal spheres and the hand laminating of cartography. Cool Material - Daily source for better gear, insightful articles, and insider info on all the stuff guys want. Craftspring - Craftspring's Nomad Collection is produced in Kyrgyzstan, where it partners with craft workshops founded and run by women and employing rural women using age-old traditional felting methods first developed by Kyrgyz nomads to make yurts and decorative rugs. Cross - Quality writing instruments. Crystal Classics - Fine crystal retailer, offering Waterford, Swarovski, Riedel, Nambe, Marquis by Waterford, Mikasa and Lalique lines. Dandelion - Contemporrary designs for the home. Since 1968, merchandise has been carefully selected from suppliers worldwide and displayed on two floors, over five thousand square feet. Dandelion is filled with treasures waiting for discovery by the discerning eye. Located in San Francisco. Deutsches Haus - A large selection of German gifts ranging from collectable beer steins and Hummel figurines to German novelty and souvenir gifts, collectable German dolls, German cosmetics, traditional German hats and feathers, unique German wine glasses, music boxes and more. DFS Galleria - A leading luxury retailer catering to the traveling public - a chain of upscale department stores and shopping malls (gallerias) comprising high-end boutiques, located primarily within Oceania and around the Pacific Rim. Dsenyo - A social enterprise supporting craftspeoples in Malawi, Africa. Dsenyo offers hand-crafted bags and accessories that celebrate African textile design and follows fair trade principles to create maximum benefit for the women, artisans and communities in which it works. Espresso Zone - Home barista supplies. Forzieri - Italian designer handbags, leather goods, watches, shoes, jackets, neckties and jewelry. Founderie 47 - Fonderie 47 transforms AK47s from Africa's war zones into beautiful and original fine jewelry. Its sales fund the destruction of more weapons in Africa. Gift Certificates Store - A convenient place for shoppers to find gift certificates to many of the nation's best merchants. Gift-Library - With designers such as Anya Hindmarch, Celestina, Nina Campbell and Alexandra Von Furstenberg, Gift-Library's gifts for women spans a complete range; from bags and accessories, to jewellery and homeware. Gifts for men including Bamford, Geoffrey Parker Games, Tateossian and Vanquish, with everything from watches and cufflinks to games and gadgets. Gizmine - World's largest Japanese gadgets and lifestyle design shop. Global Marketplace - Crafts, jewelry, clothing, textiles, pottery, aromatherapy items, and more from developing nations all over the world. Good Paper - Highly creative paper products from communities that are providing jobs to the most vulnerable of society, including marginalized women in Philippines, Africa, and northern India. Grace Teaware Fine Porcelain Espresso Cup and Saucer Set of 4, 3-Ounce (Stripe Black) - Also see IMEEA Espresso Paddle Spoons. Gucci - Gifts for her and gifts for him. Gump's San Francisco - Luxury gifts, fine jewelry, tabletop, furniture and lighting. Hammacher Schlemmer - Unique gifts, quality funcitonal products for the home. Harry & David - Fruit and food gifts. Harriet Carter - Kitchen, housewares, kitchen decor, decorative, furniture, stocking stuffers, gifts, men's gifts, personalized gifts. HereYouGo - E-greetings, greeting cards, gift suggestions and gifts directory. Hipster Appliances - Every month, Hipster Appliances brings you seasonal, hyper-specific, exceptionally designed products from exceptionally particular people. HomeWetBar - Unique home bar accessories and supplies. How to Wrap the Perfect Gift - Video presentation by stylist Megan Pflug. IBgifts - Irish gifts from world renowned brands such as Tyrone Crystal, Belleek Pottery and Hummel as well as a wide range of local fine art prints and jewelry. Jamstik - A MIDI guitar controller designed to interface with the iPad, iPhone, and Mac. Jason Office Products - Wide variety of specialty gifts, office accessories, personal organizers, fine pens, desk accessories and more. Kena Kai - Lifestyle gear, including the DataSafe RFID Blocking Security Wallets. Kent Clothes Brushes - G B Kent & Sons Ltd., manufacturers of brushes since the eighteenth century is one of the oldest established companies in Great Britain. Limonaia - Home accessories, one-of-kind jewelry, kitchen and tableware, beautiful candles, vases, stationery, handbags, gifts for babies and toddlers, cashmere throws, fun soaps, and plenty more. Little Paper Planes - An online store bringing together a community of artists. Luxist - Features real estate, trends in travel, the art world, shopping, fashion, gourmet food, wine and the spending habits of the rich and famous. LuxuryFinder - Browse extensive luxury listings by category or brand. MadeInSheffield - Sheffield craftsmenship: steel, silverware, pewterware, knives and cutlery. Maido - Stationery, gifts and fancy items, greeting cards, pens and pencils. Marcopoloni - Handmade gifts from the world over. Method - Premium home care products that are highly effective, safe, and packaged with respect for design sensibilities and the environment. Miansai - Handmade accessories brand. Milkhouse Candle Creamery - Candlemaking. Moleskine - Moleskine notebooks, journals and date books. 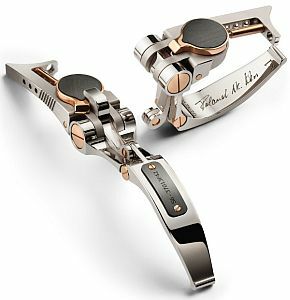 Montblanc - Writing instruments, watches, leather, jewelry, eyewear. Muma's Boxes - Luxury hampers. Needles and Pens - An emporium of zines, books, handmade goods, and an art gallery. New York First Company - Gifts, memorabilia, gourmet food, home decor, barrister bookcases, confectionary. Novica - Art, crafts, tapestries, paintings, ceramics and creative works from world artists. Quill - Quality writing instruments. Perch - Jewelry, glass, ceramics, soaps, and more. Pewter Collectibles - Tankards, flasks, and goblets. Pianki - World class luxury gifts store offering expensive gifts and upscale gift ideas for any occasion. Buy luxury anniversary gifts, retirement gifts, executive business gifts, corporate gifts, and birthday presents. Get romantic gifts and home decor gift ideas. Piero Tucci - Italian fine leather goods, from bags and jackets to wallets and gloves. Positive Luxury - Consumer guide to high quality fashion and lifestyle brands. Quintessentially Gifts - A luxury gifts and shopping service, dedicated to hand-picking the world's finest, rarest and most exquisite designer gifts. RedEnvelope - Exclusive gifts collection. Find anniversary gifts, birthday gifts, and gifts for all occasions at RedEnvelope. Shop our exclusive collection of jewelry, accessories, decor, baby gifts and more. Replacements, Ltd. - World’s largest supplier of vintage and current dinnerware, crystal, silver and collectibles. Replogle - World's largest manufacturer of globe. Product line includes the Frank Lloyd Wright Collection. Scully & Scully - Home furnishings and gifts; Herend porcelain figurines; dinnerware by Lynn Chase. Also offers a Bridal Registry, Interior Design Department, and Tabletop Consulting Service. Simple Luxuries Collection - Teamed with Amazon to provide interesting gift ideas. Solomon's Mines - Jewelry, watches, gifts, china, accessories, perfume. Stefano Ricci - Luxury lifestyle brand maintaining the highest standards of the hand-made tradition. Stein Collectors - Beer steins, collectible German steins, Budweiser steins, antique steins, glass and breweriana. Stelton - Internationally awarded Danish tableware. Cylinda Line by Arne Jacobsen. Stelton Line by Erik Magnussen, Aart Roelandt, Peter Holmblad, Torben Rasmussen and Martin Rosquist. Therapy - Diverse selection of gifts, clothing, accessories, cards, knicknacks, furniture, and novelty items. Tiffany & Co. - Luxury multinational jewelry and silverware corporation, with headquarters in New York City. Treasures Worldwide - Unique personalized gifts and gift ideas for every occasion. Vera - The Vera Company, LLC owns the extensive library of prints, original artwork, scarves, and the trademarks and copyrights of the late, iconic American artist, Vera Neumann. Vera was a pioneer in design who successfully cross-licensed her designs into linens, scarves and sportswear. Vera Wang - Vera Wang wedding dresses, bridesmaid dresses, bridal gowns, designer fashion, wedding registry, ready-to-wear, sunglasses, perfumes, home decor, tableware, and bedding. Victorinox: Swiss Army - Swiss Army brand products: knives, cutlery, watches, apparel, travel gear, writing tools. WeddingChannel - Wedding planning resources and wedding guide. Wenger - Maker of genuine Swiss Army knife, watches, fragrance, outdoor gear, travel gear, and business gear. WhatSheBuys - Gift list and reviews for quality brands and products. Wheelers - Luxury gifts, including writing instruments, leather, jewellery, fragrances. Brands include Aynsley China, Beatrix Potter, Border Fine Arts, Breed Apart, Charbonnel et Walker, Circle of Love, Coalport Snowman, Country Artists, Crabtree & Evelyn, Cross Pens, Dartington Crystal, Franz, Hot Diamonds, Jasper Conran Crystal, John Rocha Crystal, Kokeshi, Momiji, Mont Blanc, Montegrappa Pens, Mulberry, Paddington Bear, Radley, Reynard Estate, Rockingham Crystal, Royal Crown Derby, Steiff, Stuart Crystal, Swarovski, Swarovski Jewellery, Waterford Crystal, Waterlily Figures, Willow Tree, Winnie The Pooh & Friends. Williams-Sonoma - Gourmet foods and professional-quality cookware. Wine Country Gift Baskets - Gift baskets for holiday and special occasions. World's Most Expensive - Luxurypedia of world's most expensive items. Wusthof - Since 1814 Wusthof has set the standard for designing and manufacturing precision-forged knives. Today the family business is in its seventh generation of ownership, under the management of Harald Wusthof. More than 350 forged knives are available in the Wusthof assortment, along with cutting boards, knife blocks, kitchen tools, and scissors bearing the famous Trident logo - a symbol of form, function, and uncompromising quality. This webpage last updated on Wednesday, August 8, 2018 7:15 PM.